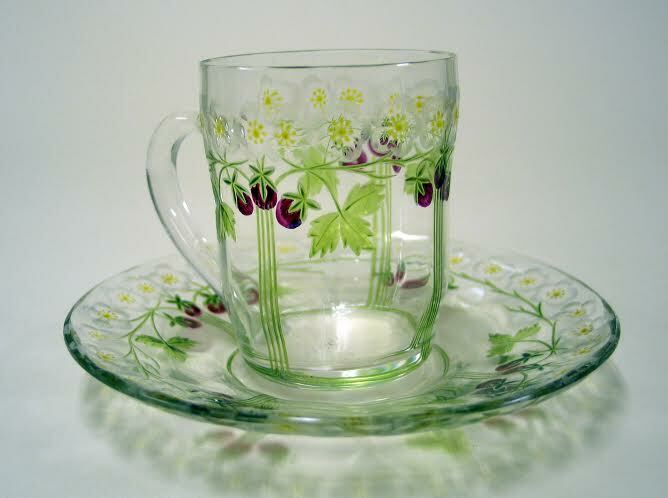 The wheel-carved glass cup and saucer (c.1905) were produced by Fachschule Steinschönau company in Steinschönau, now part of the Czech Republic. They embody the movement of avant-garde artists away from the 19th century traditional and conventional aesthetics. Indeed, in contrast to the ostentatious furniture and ornaments imitated the palaces of the French kings Louis, Nouveau Art no longer abides to the old standard of taste. Here, one can notice the simplicity of the décor of the object. The stalk of the strawberry plant is illustrated with fine strokes drawn horizontally and vertically on the sides of the object. The delicacy of the lines and colors as well as its predominantly clear glass surface of the object emphasizes its simplicity. This lack of décor reflects thus the end of the Empire Style in 1815 and a new era for Western Art. At the same time, while monarchies die out and as waves of nationalism become more prominent, countries use their own authentic art and literature to show their independence. In Steinschönau, once part of the Austro-Hungarian Empire, glassmakers in Bohemia distinguished themselves as the expert of glass-making craftsmanship, a source of national pride. The theme of nature, represented with a simple fruit plant instead of exotic fauna, embodies a fascination with the natural world as well as a more original approach to art. Ultimately, the cup and saucer embody elegance and simplicity, as well as a way of life that connects, rather than contrasts, with art across social and geographic boundaries.